The advice industry is changing rapidly – technology is upsetting traditional structures, clients are demanding more value for less money, and entire practices are being transformed. We help you navigate these uncharted waters and develop a strategy to help your firm grow and succeed in the new economy. 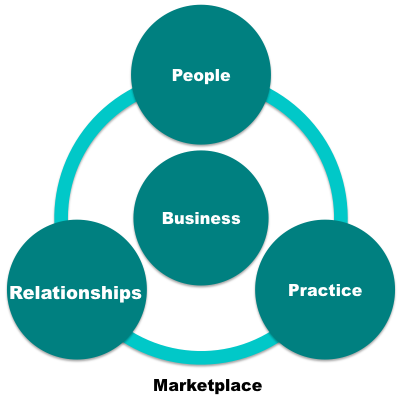 Our strategy framework focuses on the fundamentals of your business: your people, your practices, your relationships, your financials, and the marketplace. However, we never look at any piece in isolation – we understand the interrelationships between every component: the way your people drive relationships, relationships drive the business, and the business allows you to compensate and reward your people. The way your offerings exist in a competitive market, and where how you do it can be as important as what you do. And while we have experience working across firms, we don’t bring in pre-existing biases, instead we focus on replicating your successes, rather than turning you into your competitor. Finally, our approach to firm strategy is collaborative. We know that building a successful strategy requires buy-in at all levels of your firm, and that the best understanding about your client needs often happens at the front line. During the process, we challenge their ideas, push them to achieve more, and focus on results, but bring everyone along so at the end of the process, there is already widespread agreement about the right way forward. And since a strategy is only as successful as its execution, we work with your teams to make the transformation start right away.